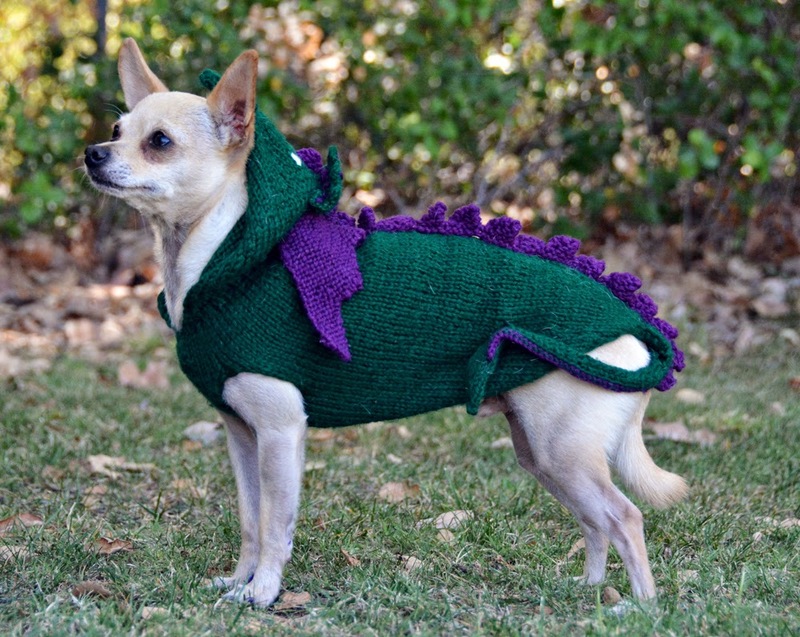 The Dog Geek: Knitting Fun: It's a Chihuahua! No, It's a Dragon! Knitting Fun: It's a Chihuahua! No, It's a Dragon! I have knitted a whole pile of sweaters for Ru, but I don't like most of them. Knitting a dog sweater isn't terribly difficult, it's actually one of the easiest projects for beginners. Knitting custom-fit sweaters for a weird-shaped dog is a bit more difficult. Free-knitting, making it up as I go along instead of following a pattern and instructions, isn't impossible as long as I don't mind unknitting and reknitting everything five or six times and hating most of my early work. Early in my free-knitting learning curve, I used random leftover yarns from various people. This resulted in Ru sweaters in colors and textures that I either hated, or that just didn't inspire me. This is one of the few sweaters that I knitted with someone else's leftover yarn, that I still like. I like adding tails to tiny dog sweaters and then tacking them up along the back or side to keep them out of the way while looking adorable. The dorsal spikes and wings were knitted separately and then sewn on. The hood is a bit oversized and tends to flop over Ru's head and cover his eyes. In the future I may knit a new dragon sweater with a better-fitting hood, but for now this is still one Ru's most adorable sweaters. We get a lot of comments on it whenever he wears it. Then yarn is Caron super soft. I remember!